This Tuscan quiche starts with a crispy crust and a savory Tuscan filling made easier by using Rustic Tuscan BLENDABELLA. 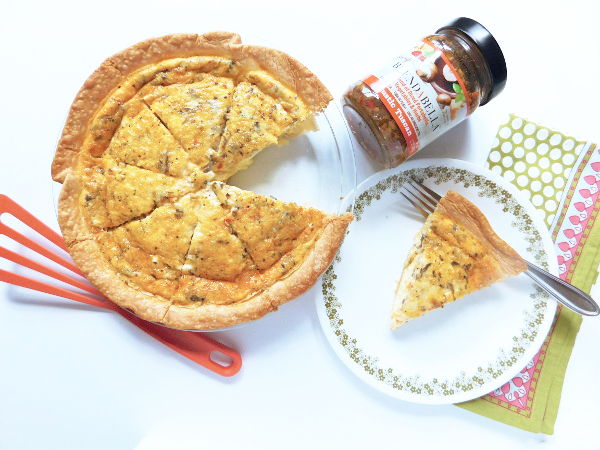 A quiche is always a great choice for breakfast or brunch! *Affiliate links may be included in this post. Please read my Discloser Policy. I received BLENDABELLA complimentary but all opinions stated in this post are my own. Who doesn’t love a quick & easy breakfast? I know I do. Quiche is one of my all-time favorite dishes to turn to when I’m wondering what to make. Need a nice breakfast for the weekend? Make a quiche! Need to make a weeks worth of breakfast for easy weekday mornings? Make a quiche! What makes a quiche such a great breakfast? For this Tuscan Quiche, add some sweet Italian sausage to the mix. Use Zesty Mexican BLENDABELLA to make a southwest quiche with chorizo and Swiss cheese. Coconut Thai BLENDABELLA would make a great seafood quiche with cooked shrimp and a smoky mozzarella. Pre-heat oven to 375 degrees. In a greased 8-inch pie plate add a thawed, prepared pie crust. In a bowl whisk together the eggs, milk and BLENDABELLA Rustic Tuscan Portabella Mushroom Blend. To the mixture add the cheese. Pour into the pie crust. Add the pie plate to a larger baking sheet in case it overflows (it shouldn’t but it doesn’t hurt to be prepared). Bake for 40 minutes. Test the quiche with a toothpick or knife to make sure it comes out clean. Let the quiche cool for 10 minutes. Cut into eight pieces and here you are….. 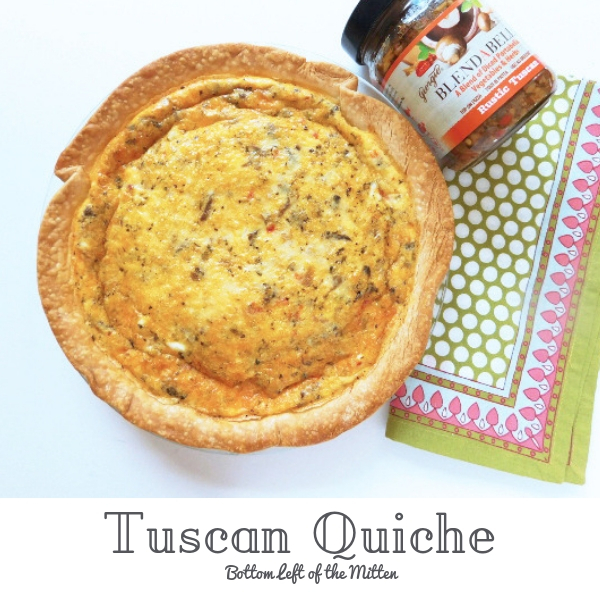 This Tuscan quiche starts with a crispy crust with a savory Tuscan filling made easier by using Rustic Tuscan BLENDABELLA. A tasty way to start to the day. 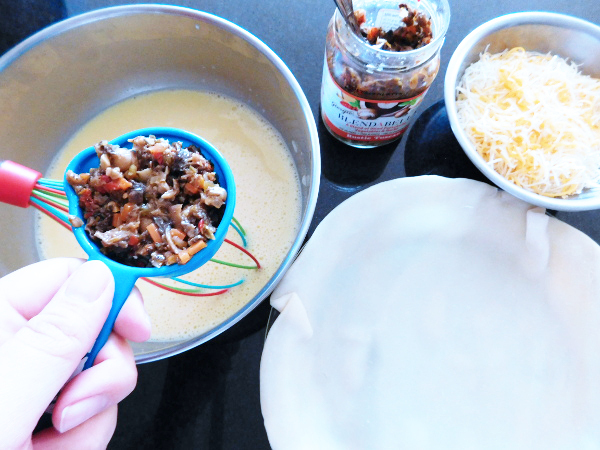 In a greased 8-inch pie plate add a thawed, prepared pie crust. In a bowl whisk together the eggs, milk and BLENDABELLA Rustic Tuscan Portabella Mushroom Blend. To the mixture add the cheese. Pour into the pie crust. Add the pie plate to a larger baking sheet. Test the quiche with a toothpick or knife to make sure it comes out clean. Let the quiche cool for 10 minutes. Cut into eight pieces. Enjoy! Do you love making big breakfasts during the weekend? Or like to make a breakfast casserole on Sundays so there are plenty of leftovers for weekday mornings? If you say ‘yes’ to either of those then this Sausage Hash Brown Casserole is for you! This casserole is loaded with potatoes, sausage, cheese, eggs and a special ‘secret ingredient’. This stick to your ribs recipe is made for a crowd or even better as leftovers. I first had this dish while staying the weekend with my family up in Muskegon. It was such a great weekend visiting with family and lots of great food. On Sunday morning, we woke up and my stepmom made a big breakfast and the main dish was this sausage hash brown casserole. It was so good! While I was gobbling it down I asked her what was all in it so that I could make it once we got home. She said the first few ingredients which were a given: hash browns, sausage, cheese….but then she said ‘french onion dip’. What? You mean like chip dip? Yes! Even though it’s not something that I would have thought of, I now can’t imagine a savory breakfast casserole that isn’t a combination of creamy sour cream and french onion dip. Now on to the breakfast casserole recipe! Start by defrosting the hash browns according to the package directions. While the hash browns are thawing, in a pan on the stovetop cook the breakfast sausage and onions until cooked all the way through. Should take around 8-10 minutes. Remove the sausage from the pan and place on a plate with a few paper towels. Depending on how fatty your sausage is there may be grease that needs to drain off. Preheat the oven to 350 degrees and grease a 9×13 dish. Next in a bowl whisk the eggs, milk, salt, pepper, and Spanish paprika. In a large bowl add the container of sour cream and french onion dip. Stir to combine. Now add the thawed hash browns to the bowl followed by the egg mixture. 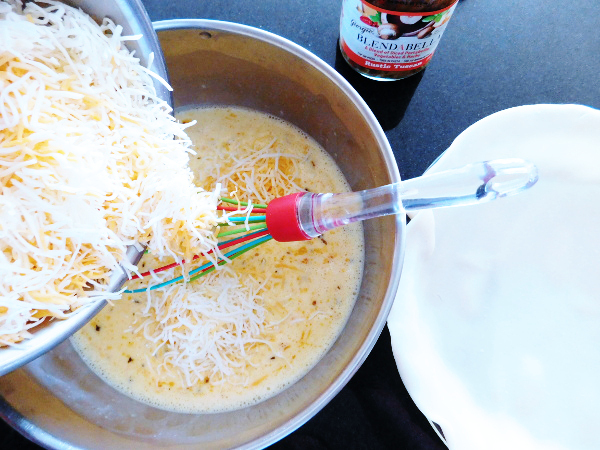 Finally, add all but 1/2 a cup of the cheese to the bowl. Stir it all together so that everything is all combined well. Add it to the prepared pan and spread it evenly. Sprinkle with the remaining cheese on the top. Cover the pan with tin foil then cook for 50 minutes. Cut into 12 pieces and serve with a big bowl of fruit, biscuits, and jelly. Do not skip defrosting the frozen hash browns. If you try to cook them frozen your casserole will take about…5 hours to cook. Now if you are having a really lazy Sunday then fine but you would probably have all your coffee drank by then and what fun is that? Need this recipe for an even bigger crowd? Double the batch and bake in a large foil 20×12 baking pan. Add 20 additional minutes to baking time. This sausage hash brown breakfast casserole is made with a special ingredient - french onion dip! Perfect for weekend breakfast or brunch. Fill up a big glass of orange juice and dig in. Defrost the hash browns according to the package directions. In a pan on the stovetop cook the breakfast sausage and onions until cooked all the way through. Should take around 8-10 minutes. Preheat the oven to 350 degrees and grease a 9x13 dish. In a bowl whisk the eggs, milk, salt, pepper and Spanish paprika. In a large bowl add the container of sour cream and french onion dip. Stir to combine. Now add the thawed hash browns to the bowl followed by the egg mixture. Finally add all but 1/2 a cup of the cheese to the bowl. Stir it all together so the everything is all combines well. Add it all into the preprared pan and spread it all evenly. Sprinkle with the remaining cheese on the top. Cut into 12 pieces and serve. Enjoy! Do not skip defrosting the frozen hash browns. If you try to cook them frozen your casserole will take about...5 hours to cook. Now if you are having a really lazy Sunday then fine but you would probably have all your coffee drank by then and what fun is that? Need this recipe for an even bigger crowd? Double the batch and bake in a large foil 20x12 baking pan. Add 20 additional minutes to baking time. Need a break from ordinary bread? Don’t have all day to spend making a loaf of bread from scratch? Enter Salsa Bread. A quick bread recipe full of spicy jalapenos, green chilies and juicy tomato goodness of the salsa you love. Perfect for sandwiches or even as a side to spice up taco night. As I’ve stated many times before I really haven’t had the easiest time learning how to bake. I like to stick to hearty meals that can be paired with beer. The closest I get is jazzing up boxed cake mix for sweet or pizza crust for savory. However, I was willing to give baking a try so I could make this bread for a specific sandwich I am trying to recreate. After a little searching I found and baked this recipe for Dill Pickle Bread from Delish. It turned out fabulous and the recipe was so simple that I figured it was a perfect one to adapt for this. Guess what? It turned out exactly how I wanted. Yeah! So now on to the recipe for this spicy Salsa Bread. First let’s start by preheating the oven to 350 degrees and make the salsa. In a food processor combine the drained tomato with green chilies, jalapenos, garlic cloves, cumin and red onion. Pulse until there are no longer chunks and it has a slightly soupy consistency. In another bowl or mixer, start to make the bread base. Add sour cream, vegetable oil, egg and salsa mixture. Stir to mix all the wet ingredients together. Now start adding dry ingredients: flour, baking powder, sugar and salt. Prepare a bread loaf pan with spray or oil then add dough to the pan. Place the pan into the oven and bake for 40-45 minutes or until a knife comes out clean in the middle. Let the bread cool for 10 minutes then slice and eat. This quick recipe for Salsa Bread is full of spicy jalapenos, green chilies and juicy tomato goodness of the salsa you love. Perfect for sandwiches! In another bowl or mixer start to make the bread base. Add sour cream, vegetable oil, egg and salsa mixture. Stir to mix all the wet ingredients together. Now start adding dry ingredients: flour, baking powder, sugar and salt. Prepare a bread loaf pan with spray or oil then add dough to the pan. Place the pan into the oven and bake for 40-45 minutes or until a knife comes out clean in the middle. Let the bread cool for 10 minutes then slice and eat. Enjoy! Who says you can’t have your cake and enjoy a beer too? Pour a cup into this cake batter then enjoy the rest while the cake bakes. 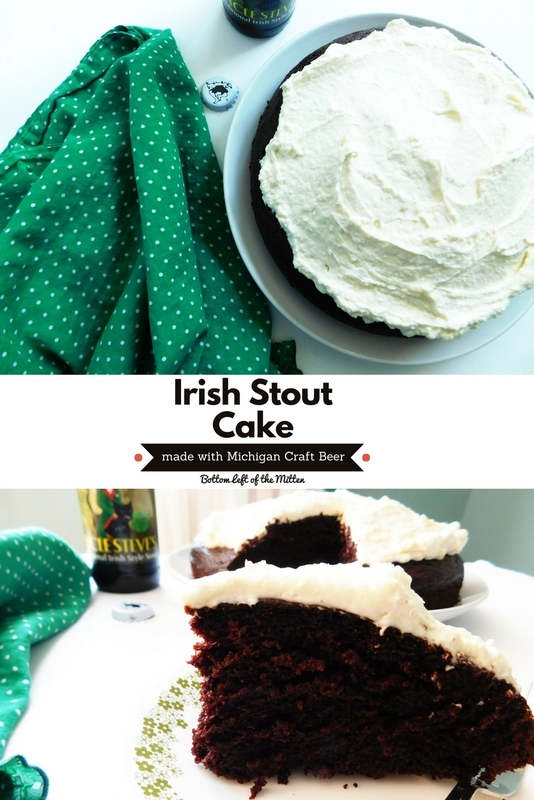 This Irish Stout Cake is the perfect dessert for upcoming St. Patrick’s Day. 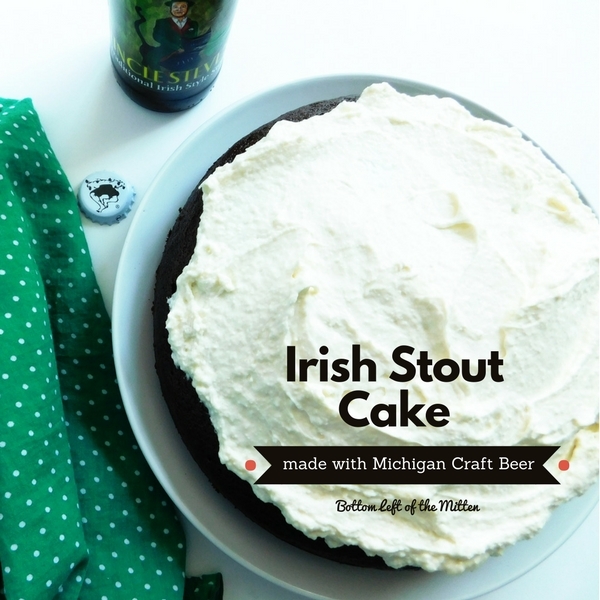 Did I mention that I made it with Michigan Craft Beer? Celebrate the Holiday and Michigan in one sweet dessert that is so easy to make. I’m so excited this year to participate in #FoodBloggerLove recipe swap. This event is all about showing the ‘love’ to other Food Bloggers and recreating their best recipes. I am pairing up with Amy Bartlett over at Savory Moments. 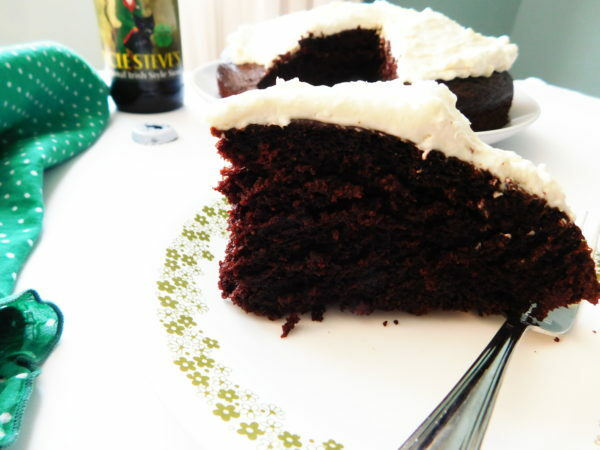 There were so many wonderful recipes on her site that by the time I finally settled on one I had a bunch more on my list to make but once I landed on her Guinness Chocolate Cake I knew this was the perfect recipe. Check out Amy on Instagram, Facebook, Pinterest and of course on her blog where she’s cooking it up in the kitchen – can you believe she does it all with twins running around? If you follow Bottom Left of the Mitten at all you know that I do a lot of food and beer pairing but I haven’t ever cooked ‘with’ beer let alone bake with it. I’m glad that I went outside my comfort zone for #FoodBloggerLove. Not only was Amy’s recipe really easy it gave me an opportunity to swap out the original Guinness that she used for a Michigan Craft Beer which I’m always 100% here for. So if you want you can use 1 cup of Guinness or do I like I did and reach for Short’s Brewing Uncle Steve’s Traditional Irish Style Stout. Now on to the cake!! To start preheat the oven to 350 degrees. Grease a 8-inch springform pan. On the stove top over medium heat in a small pan heat the butter until melted then add 1 cup of beer. Turn off the heat then add the cocoa powder, sugar and brown sugar. Set aside to cool. In another smaller bowl add the eggs sour cream, vanilla then stir to combine. Now in a larger bowl add the dry ingredients: flour, salt and baking soda. Once the butter & beer has cooled down add to the dry ingredients. Then add the sour cream & eggs to that. Make sure the springform pan is liberally greased or you can even add parchment paper to it. Place the pan on a cookie sheet just in case the bottom leaks a little bit then add the batter. 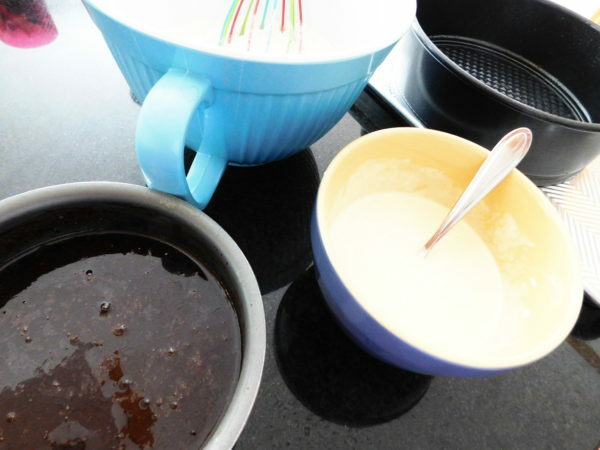 Bake the cake for 45-55 minutes depending on your oven. Mine went for a full 55 minutes. The top of my cake did crack and you know of course I just watched a baking hack video where it showed how not to have that happen but of course I forgot and you know what, oh well. It turned out perfect! 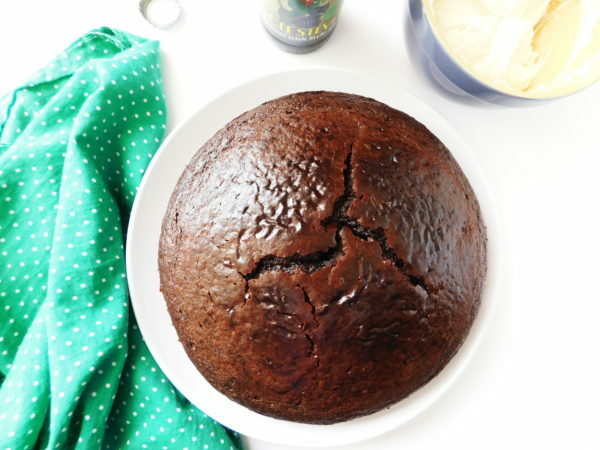 Take out of the oven and then use a knife to scrape the sides of the pan to release the cake from the sides then flip open the springform pan. Put the cake on a cooling rack or plate and let the cake cool fully. Time to make the frosting! Use one tub of mascarpone cheese and add sugar and vanilla until completely combined. Spread over the top of the cake. Cut into 8 slices and here you are…. 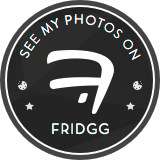 Check out all the other #FoodBloggerLove recipes! Moist and fluffy chocolate cake that is so rich and delicious. Topped off with sweet mascarpone frosting. The perfect recipe for St. Patrick's Day and beyond. To start preheat the oven to 350 degrees. Grease a 8-inch springform pan. On the stove top over medium heat in a small pan heat the butter until melted then add 1 cup of beer. Turn off the heat then add the cocoa powder, sugar and brown sugar. Set aside to cool. In another smaller bowl add the eggs sour cream, vanilla then stir to combine. Now in a larger bowl add the dry ingredients: flour, salt and baking soda. Once the butter & beer has cooled down add to the dry ingredients. Then add the sour cream & eggs to that. Add to the pan. Bake the cake for 45-55 minutes depending on your oven. Take out of the oven and then use a knife to scrape the sides of the pan to release the cake from the sides then flip open the springform pan. Put the cake on a cooling rack or plate and let the cake cool fully. Use one tub of mascarpone cheese and add sugar and vanilla until completely combined. Spread over the top of the cake. Cut into 8 slices. Enjoy!